Stoke City goalkeeper Asmir Begovic has admitted that it was a relief to leave troubled club Portsmouth during the January transfer window. The Bosnia international told BBC Radio Stoke: "The problems take over your life sometimes but you have to get on with it. "To come here and be in a more stable position is exciting for me." 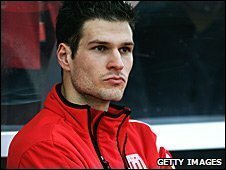 Begovic, 22, joined the Potters for £3.25m on 1 February, but has yet to make his first-team debut for the club. Portsmouth avoided being wound up on Wednesday, but were given seven days to produce a full statement of their affairs and pay off a multi-million pound unpaid tax bill. "You were worried all the time because there were different problems every day [at Portsmouth]," added Begovic. "It's not nice to have to deal with that, so to come to a well-run club is definitely a relief for myself." Begovic now faces a battle with Thomas Sorensen for the number one jersey at the Britannia Stadium, but said he is prepared for the challenge. "Thomas is a fantastic goalkeeper and deservedly playing," said Begovic. "I've got to compete for a first-team spot, which is fine by me. "I'm sure my time will come. I've got plenty of years here, hopefully I'll be here for many years and I can make an impression."